The Louisiana State Bar Association's Young Lawyers Division will present its 2019 Louisiana Young Lawyers' Conference, "Build Your Brand" on Friday, January 18 at the Renaissance Baton Rouge Hotel (7000 Bluebonnet Blvd., Baton Rouge, LA). The conference is open to the first 100 young lawyers who register for a cost of $50.00. Online registration will close at 3 p.m. on Jan. 16, however on-site registration will be available if there are spots available. The conference has applied for 5 hours of CLE credit (including 1 hour of ethics, 1 hour of professionalism and 1 hour of law office management). Chat with other attendees about law related topics that interest you in this speed networking format. Sign up at the meeting registration desk by 12 noon for the restaurant of your choosing for an evening of camaraderie and food with your fellow attendees and YLD Council members. Dinners are Dutch-treat. 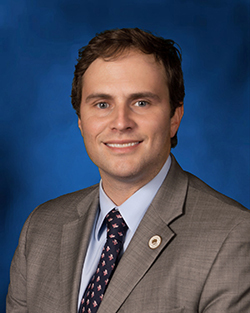 Tanner Magee is a lawyer and a Republican member of the Louisiana House of Representatives, representing District 53. He was first elected to the chamber in 2015. Tanner lives in Houma and works in various areas of the law. The Marcello's family of restaurants has arrived in Baton Rouge providing the same five-star quality food and excellent service as they do in New Orleans & Lafayette. Only the freshest ingredients are used and reflect authentic Sicilian cuisine with a touch of Northern Italy. Their wine concept is giving guests the choice to browse the racks and make their selection from value priced wines. The Young Lawyers' Conference is open to Young Lawyers ONLY for a a cost of $50. *Important Note: A link to the conference materials will be emailed to your email of record with the LSBA prior to the conference. You may decide to print the materials in advance and bring with you, or download to your electronic device to view in the seminar. If you choose to review the materials from your laptop or other electronic device, we strongly suggest you charge the battery, as electrical outlets may be limited. Internet access will not be available in the meeting room. Cancellation of registration must be received in writing by the LSBA no later than Monday, January 14, 2019. Cancellations will receive a full refund. Absolutely no refunds will be made after Monday, January 14. If you register on or after Monday, January 14, 2019 no refunds will be given.